The Safepacker holster is one of those unique designs that fulfill a number of functions. Constructed of tough Cordura nylon and thick closed-cell neoprene padding, the Safepacker was originally designed to completely protect a firearm and reload for armed mountain rescue teams whose equipment received hard use in tough terrain and climates. The inside of the safepacker will hold a pistol and a spare magazine. The side is fastened using a Velcro strip. Once the retaining strap has been opened, the pistol can be quickly accessed simply by thrusting the hand in and grabbing it. It comes in right and left hand models and in various sizes to accommodate a wide variety of automatic pistols and revolvers. Colors include black, brown, green and camoflage. The cover flap is also a smaller pouch that is Velcro closed which can store a variety of articles. 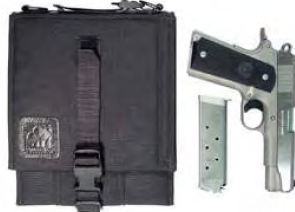 The holster has a carrying handle on top and two D rings that a removable shoulder strap attaches to. The Safepacker can be carried a number of ways. You can attach it to your belt using the large belt loop on the back, across your shoulder using the carrying strap, in your hand using the carrying handle, or attached to your rucksack a number of ways.